Well, how about that? Most of the seeds made it through the first round and some of the match ups ended the way most of us expected. Thankfully the Isner and Mahut tennis match was only just over two hours – instead of their epic, record setting match from last year (over 11 hours) – and again Isner walking away the victor. Federer, Nadal, Roddick, Tsonga, Djokovic, Soderling, Fish, and many more of the household names have made it though in normal fashion. However, there have been quite a few upsets so far; James Blake out in 5, Marin Cilic out in 4, Janko Tipsarevic retired, and Alexandr Dolgopolov out in 4. Same goes for the ladies; Jelena Jankovic out in 3 (you cannot be serious), Sam Stosur out in straights, Shahar Peer out in 3, and American hopeful Melani Oudin. Of course most of the women’s seeds moved on and round 2 continues on; Caroline Wozniacki, Maria Sharapova, Na Li, Francesca Schiavone, Victoria Azarenka, and Vera Zvonareva all roll on to round 2. Now the real story at this years Wimby is that of Serena Williams, the defending champion. She played her first round today and it was a true test of where she is in her current tennis game. Williams was matched up against a hard hitting Frenchwoman Aravane Rezai, who Serena had only met once before on a hard court (Sydney 2010). Serena’s tennis was mediocre at best, obvious her shot selection and footwork were rusty but she pulled out the win regardless. I won’t call it a comeback just yet, she will need to face a more solid opponent. Either way, she’s off to a pretty good start. 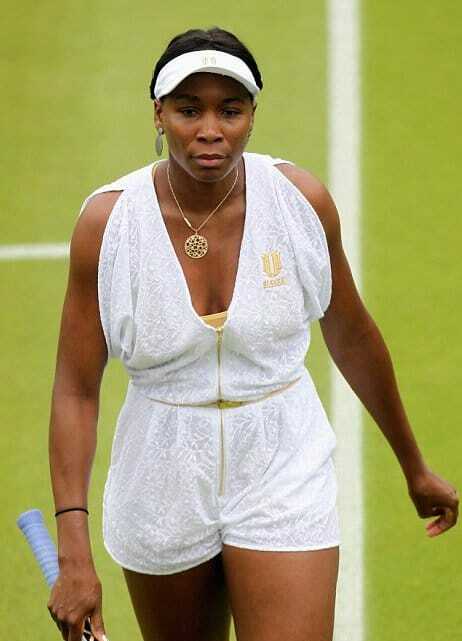 In other news, there’s the disastrous train wreck of an outfit Venus Williams displayed in her first round. I literally shuttered in disgust when I saw her “outfit”, I remember my wife saying “it looks like she’s wearing a baby’s onesie (a baby bodysuit)!” I could not agree more. I mean, really what is Venus thinking? I know, I know, it’s not a fashion show, it’s a tennis match but the reality is, the outfit was distracting me from the actual tennis being played. My suggestion to V. Williams is, stick to what you’re good at…tennis. Ok, I got it out of my system. Round 2 should be much more exciting and I hope the weather cooperates! I would like to see a TENNIS SENIORS tounament like the golf seniors tounament. Paul, there is a ‘seniors tour’ for the older tennis players, it’s the Champions Tour. Do you have some guesses for the men & women playing in the finals? Funny that you ask Mike, the predictions are coming tomorrow 🙂 Stay tuned!